This entry was posted in Reputation Management, Society and tagged New Jersey Transit, New York, St. Patrick's Day by RepMan. Bookmark the permalink. I second that emotion, Julie. Btw, the NJ Transit Middletown train station looks as if a tsunami roared through it. 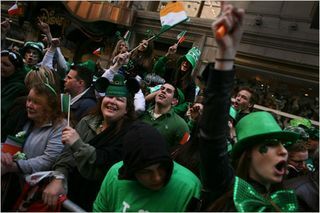 Drunken high school hooligans on St. Patrick’s Day pack the punch of a category five hurricane. I say NYC should abolish all parades, and that would take care of Dante’s inferno on March 17. Just wastes taxpayer money and causes traffic nightmares. Let’s all celebrate being American…and for that, we don’t need a parade. True that, as Catharine Cody would say. It’s hell on wheels. Literally. And let’s not forget that when these people have had too much to drink they are inclined to urinate wherever possible to relieve themselves and the next thing you know it smells just like the subways in Manhattan.